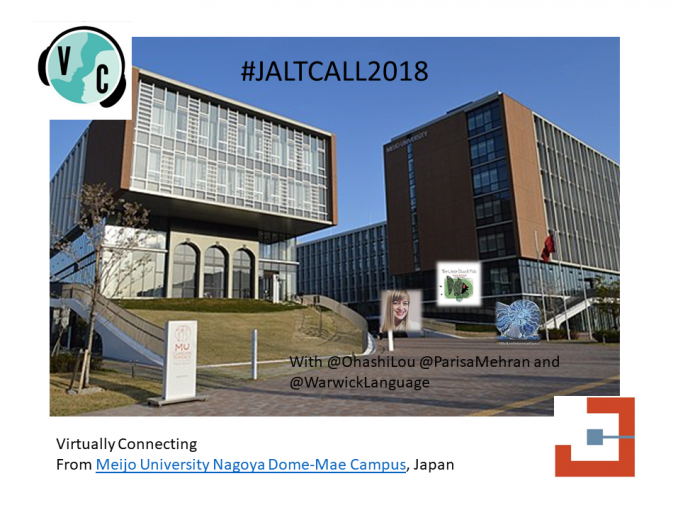 JALTCALL is a Special Interest Group (SIG) of JALT (Japan Association for Language Teaching) for educators and researchers who share an interest in digital technology and language learning. JALT holds a major conference every year in early/mid June. There is also a refereed journal, the JALTCALL Journal, and regular articles in the Digital & Mobile Language Learning (DMLL) blog. Membership information can be found on the membership page of the JALTCALL website. The Virtually Connecting session will run on Saturday June 9th at 4:10 p.m. (local Japan time) with virtual buddy Teresa McKinnon (@warwicklanguage) and the on site buddies will be Parisa Mehran (@ParisaMehran) and Louise Ohashi (@OhashiLou). The guests include Agnieszka (Aga) Palalas and Kazunori Nozawa. The Twitter hashtag for this event is #JALTCALL2018. To join this Virtually Connecting session from anywhere in the world, please add your contact details to this form. We will use this information to keep you informed about the session. I couldn’t be physically present at EUROCALL2017 due to visa rejections and Virtually Connecting helped me surpass the political boundaries (here is the link to the story: https://parisamehran.wordpress.com/2017/09/01/denied-yet-present-at-eurocall-2017-a-memoir/). I’ll be an on-site buddy soon to connect! There’s always a bright side 🙂 Thanks VC for connecting; thanks for planting seeds of hope <3 See you soon!